Kamala Harris is now officially running for president. Her California base is a large part of the Democratic party. This is also reflected in the Pledged delegates and Superdelegates. She has already visited South Carolina which holds the fourth democratic primary election. She is likely as an African-American to replicate the success of Barack Obama in the southern states from Maryland to Louisiana based on the demographics of the Democratic party in these states. As a female candidate Senator Harris also doesn’t carry all of the baggage of Hillary Clinton. 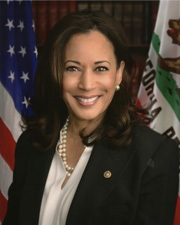 She is much younger than either Bernie Sanders or Joe Biden, and yet she has good experience as the Attorney General in California and as a Senator. She appears to be likable unless she is attacking you. Sen. Harris has taken a “Never Trump” stance on his nominations for cabinet positions and the Supreme Court. On policy she opposes Trump on immigration, taxes, healthcare and guns. Some of her rhetoric, however, has been over the top, such as at least referencing and thus promoting a comparison between ICE and the Ku Klux Klan. She also attempted to apply an anti-Catholic religious test to a judicial nominee because he belonged to the Knights of Columbus. Like most of the other candidates she is moving toward the far left. In a general election it would again be a battle between red states and blue states. (c) 2013 All Rights Reserved. Powered by Blogger.